Alonso joined the Natural Resource Governance Institute in 2013 and is based in the Lima office. Prior to joining NRGI, he was a researcher and consultant in Peru, working with nongovernmental organizations, international development agencies and the public sector. At NRGI, Alonso is in charge of managing projects related to NRGI’s Mexico program, providing technical assistance to the Mexican government and advocating for wider civic space. Alonso also contributes to the research and analysis agenda of NRGI's Latin America regional office. 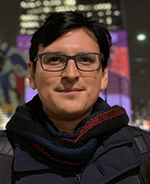 Alonso holds a bachelor’s degree in anthropology from San Marcos University in Lima and an executive master’s in development policies and practices from The Graduate Institute of International and Development Studies in Geneva. Alonso is currently finishing a master’s degree in human rights at Pontificia Universidad Católica del Perú. His interests include water governance, territorial management and data analysis.